Eclipse Comics, 1978-1991, an age undreamed of - RKMBs v9.0: Rob's Damn Boards .:|:. A pretty cool blog that covers Eclipse comics from beginning to end by the titles published. Without Eclipse, there might not ever have been creator royalties. And without Eclipse, there might not have ever been Pacific Comics to follow the path and kick the door open to creator rights even wider. And then came First Comics, Comico, Capital, Innovation, Fantagraphics, Graphitti, and all the rest. The 1980's was a tremendous period of creativity and innovation, arguably a nother golden age. Before the darkness set in. My favorite period is from about 1965-1985. But from 1981-1990, I think there was never more freedom to publish just about any idea a writer or artist could have. And Eclipse was the genesis of that. The first Eclipse book was SABRE by Don McGregor and Paul Gulacy, in 1978, among the very first graphic novels. 40 pages in black and white, with this wraparound cover. There was also a 2nd printing (the version I first got), a 10th anniversary printing (1988), a 20th anniversary printing (1998), and a 30th anniversary printing. In addition, it was reprinted as the first two issues of the SABRE comic series. Which I like best because it presented the issues in color, and in a comic book size. When I want to see it in black and white, I like the 20th anniversary edition best. 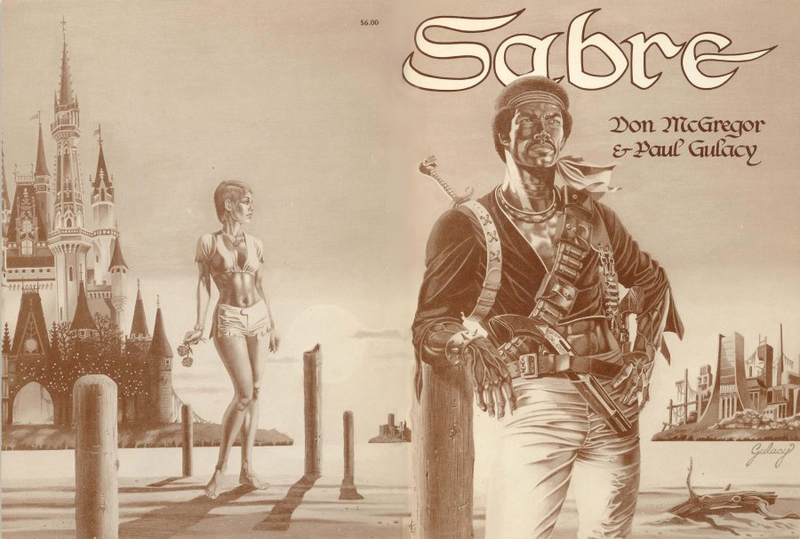 The initial SABRE graphic novel, along with the initial releases for 4 years, presented stand-alone works in a magazine-size book format, that in both size and as stand-alone works set them aside from pretty much everything else being published. They didn't start doing comics till 1982.